First off, Yahoo answers is much more appropriate for this. Second, static friction absolutely when not moving, but once moving, kinetic friction plays a bigger part. Skis and snow have a low friction coefficient. Tension maybe if you think about bindings and springs and such. Weight and force, idk as I don't remember the definitions, but probably. I assume there's a picture to this problem as well? IsitWinterYet17 I assume there's a picture to this problem as well? unless he's on a t-bar, it's everything except static and tension. if he's on a t-bar, add tension. 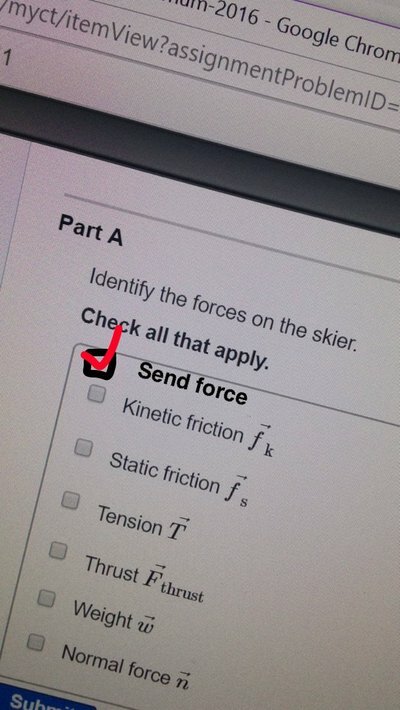 I'm a physics major and I can tell you that this is a trick question. The only force present is actually a yoda force. OP you really need to understand every concept that is listed there. Being able to do this question by getting an answer from online won't help you on the test.